Katrina’s husband Marc, a US Marine, was deployed when she was about three months pregnant. 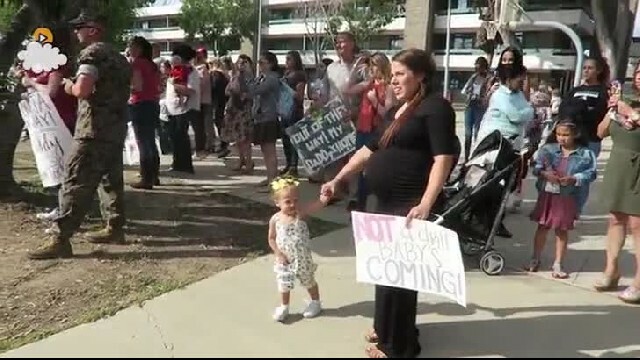 During his entire deployment, the military couple kept joking about how she could go into labor on the same day as his homecoming. Of course, Katrina and Marc tried to not think about the possibility of him missing the birth of their second daughter. Lo and behold, Katrina went into labor 10 days early — on the same exact day Marc was scheduled to fly back home! Her painful contractions kicked in about one hour after he boarded his first plane to come home. “I was determined to be there to pick him up, so I just prayed my heart out, and begged baby girl to wait for her Daddy,” Katrina said. When Marc landed, he checked his phone and saw a text from his wife: “I think you better hurry!” It was accompanied by a screenshot of her contraction timer app. Watch the video below to see what happened when Katrina and Marc finally embraced as the contractions persisted… and please SHARE this incredible viral video with your friends on Facebook!